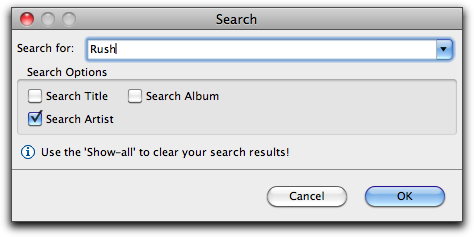 Use the search dialog to find tracks. Once you enter a search, click OK and the tracks that match will show up in the Song Table. Use the Show All button or the Show All command in the SuperSync's Search Menu to reset the search and show all tracks. Tip: To quickly navigate to a particular table item, simply select the table and type the name of the artist, album or genre. Example: To quickly navigate to the artist "Rush", click on the artist table, and type "rush".